It's been a very long winter and early spring. The amount of going going going that I've had to do has started to wear on me. It's times like this that finding gratitude in daily life becomes a bit hard. I really have to look around and outside of myself to see what I can be grateful for when another client wants his stuff NAO and I have more things to do outside the office so what I do inside the office doesn't get done. You know the feeling. You want the world to STOP so you can get off, just for 24 hours. A guild mate of mine got engaged to his long-time girlfriend. They are wonderful people and parents to a trio of very, very cute kittens. I had to send a card. I also had to be out in the field, yet again. So, I combined the work with the play and ran by a Target store to get a card. The thought crossed my mind that Target sells carbonated beverages and having some of those wouldn't make the long hours and the travel go away, but it would make them easier to bear. To my surprise, there was a sale. You had to buy 5, but even the regular price in this Target was cheaper than the regular price in the Target near me. 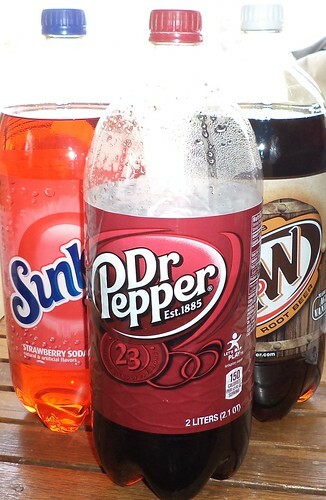 Although I prefer cans or bottles for portability, one must always be open to price, particularly on soda. You can see I dove into that Dr Pepper as soon as I got home. Now, it hasn't made the travel any less of a bear or eased the knowledge that I will be working overtime through the rest of the month to get everything done. But I am grateful for ice cold beverages in the fridge for those days I stagger home and just want to collapse.